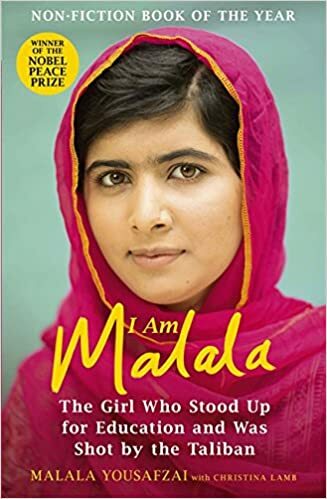 I am Malala – Education for girls!!! I have just returned from watching the film about the life of Malala Yousafzai. What a brave girl! She deserved the Nobel peace prize! Her father did too! The Taliban preach a brand of Islam that I find disgusting. They preach intolerance, fundamentalism that is the most extreme fascism. Islam means peace. For the Taliban it means power. They rule with the gun and the bomb. They believe females are second-class citizens. They shoot all who speak against them. They blow up schools. They terrify and frighten. That is not religion. That is politics. Malala, like her father, spoke up for the rights of women. The Taliban threatened them. She was cold-bloodedly shot in the head. Is there a name for an armed man who shoots a young teenage girl in the head? I can think of a number. Coward comes to mind as one of the more printable ones. If we do not speak out against inequality, intolerance and injustice then the fascist scum win. It takes brave people like Malala to stand up to fascist thugs. My only criticism was her clothing. While her father and brother were free to wear whatever they wanted seemingly Malala was not. She was consigned to medieval costume. Nice if its an option – obnoxious if it is enforced, expected or pressured. Until she is free to wear whatever she wants and feels comfortable to do so – like the males in her society – there is no equality. I see headscarves, burqas and hijabs as misogyny. Thank you Malala. I’m now going to read your book. I loved what you said about education – one teacher – one pen – is mightier than all the oppressive doctrine of fascist scum. The Taliban, A Qaeda, Boko Haram and the rest of the scum are more terrified of education than they are of bullets and bombs. Education enables people to ask questions. No tyranny or religious dogma can survive in the face of questions. Educating girls will make the world a better place!